I think I'm going to keep this one simple, short and sweet and let the pictures do the talking! If you're a lover of the flavor combination of chocolate and strawberries (like I am!!!) then you're going to love these! I started with the usual moist chocolate cake- it's so light and fluffy and very very chocolaty! Then topped each and every sweet cupcake with the BEST strawberry buttercream frosting I could conjure up. I mean...the best. Fresh organic strawberries are pureed with yummy homemade vanilla bean sugar and added to sweet cream buttercream frosting. This is not (and never has been) your standard butter/powdered sugar frosting. I like to use rBST free egg whites and vanilla bean sugar- slowly cook together to the perfect temperature and then beat until light and fluffy! Then sweet cream butter is added very slowly to ensure proper texture along with homemade vanilla bean extract. That would be my standard vanilla buttercream- but to make it fresh strawberry, I then drizzled in that strawberry puree I was previously mentioning until just perfect! No artificial colorings or flavorings are added- so this frosting includes slight bits of strawberries and is the slightest hue of pink. It's such a wonderful combination! We are just starting to get into the strawberry season, so I was stoked to make these. Our edible hearts are also available for purchase, on our Etsy site. 5. Immediately pour batter evenly into 24 cupcake tins (filling up 1/2-3/4 of the way) and bake until cake bounces back when touched in middle and a toothpick comes out clean- about 20 minutes. Check after 15 minutes. Then bake in 5 minute intervals after- until toothpick comes out clean. 1. In small food processor puree FRESH strawberries (not frozen) until a smooth consistency. Reserve 3/4 cup for your buttercream. Add 2 tablespoons sugar and mix together, set aside. 2. Over a pot of simmering water, create a double boiler with kitchen-aid mixer bowl. Whisk egg whites and sugar into mixing bowl and set over pot of boiling water. Continually whisk over simmering water until sugar dissolves when rubbed between fingertips – about 5 min. 3. With whisk attachment, whisk in mixer until egg white form still peaks and are completely cool. This will take quite a while- 15 min or so. Just keep touching the bottom of your mixer bowl until you cannot feel heat whatsoever. 4. One square at a time, add butter while mixer is continually whisking the egg white/sugar mix. Continue to do this until all butter is incorporated. Add vanilla extract and vanilla bean. If it looks loose don't worry, it will come together. If you'd like to help it along, rub ice or ice packs underneath the mixing bowl while it's going to help cool down the buttercream with butter. 5. Lastly add your fresh strawberry puree. Mix until fully incorporated. Fill a pastry bag with large star attachment (like an Ateco 826 or Magic Tip 8ST). ***If using that day, keep room temp. If using later- can refrigerate 3days and freeze up to a month. Bring back to room temp and beat with a paddle attachment before piping. 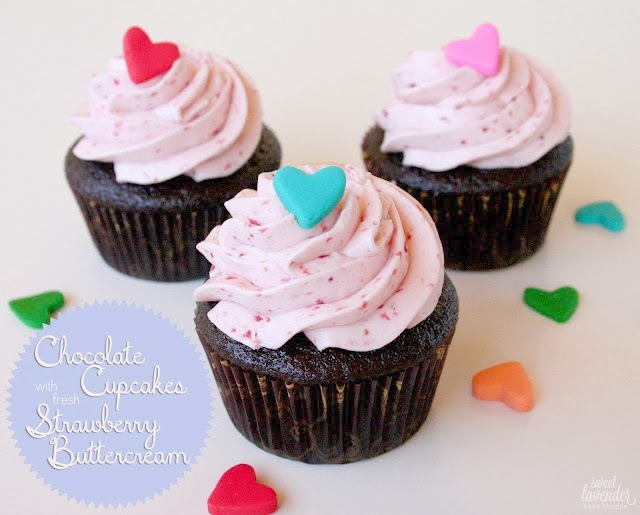 Simply take a chocolate cupcake and pipe on your fresh strawberry buttercream! Decorate with a fresh strawberry, chocolate drizzle...or these hearts. I'm not one to comment on blog posts of people I don't personally know, but this time is an exception. These chocolate cupcakes (not inclusive of frosting cause i used a different one) are THEEEEE BEST CHOCOLATE CUPCAKES I'VE EVER HAD OR MADE! soooo light fluffy, yet moist...like biting into a chocolate cloud. Oh, btw I omitted the coffee cause I felt that it was optional, still tasted AMAZING. Oh my goodness! SO happy to hear this! Isn't it a beauty?? It's hands down my favorite chocolate cake recipe around! So glad you enjoyed too! Hi can you please explain more what you mean about whisking over the double boiler? Basically what that means is you are going to take a medium sized pot and add water to the bottom. Bring that to a simmer. Then you are going to place your stand mixer bowl, (or a metal or glass bowl) over the top of that. The pot needs to be small enough so that that the bottom of your bowl does not touch the simmering water. Add your egg whites and sugar and whisk in that bowl, over the simmering water, until the sugar has dissolved but the whites are not cooked. About 5 solid minutes. Just place your finger in the mix and rub mix between your fingers. You shouldn't feel any granules.